Mexican soldier and politician, born at Jalapa in the province of Vera Cruz on the 21st of February 1794. He was neither a general nor a statesman, nor even an honest man, but he was the most conspicuous and continuously active of the military adventurers who filled Spanish America with violence during the first two generations of its independence. He entered the colonial army of Spain as a cadet in 1810, and served as one of the Creole supporters of the Spanish government until 1821. In that year Mexico fell away from the mother country. 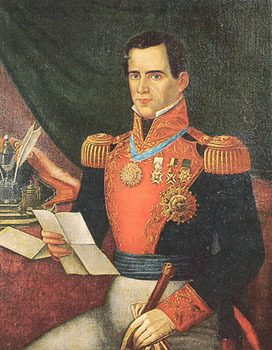 Agustín de Iturbide, who was master of the country for the time, made Santa-Anna brigadier and governor of La Vera Crux. Until about 1835 he pursued the policy of keeping his hold on his native province of Vera Cruz, and influencing the rest of the country by alternately supporting and upsetting the central government. He first helped to ruin Iturbide, who wished to make himself emperor. He proclaimed the Republic, and was then a supporter of the successful federal party. Federalism suited him very well since it left him in command of Vera Cruz. In 1829 he defeated a foolish attempt of the Spaniards to reassert their authority in Mexico. He kept himself in reserve until events gave him a chance to upset the president of the day, Bustamente, whom he defeated at Casas Blancas on the 12th of November 1832. He could now have become president himself, but preferred to rule through dummies. Now that he saw an opportunity to become master he became reactionary and abolished the federal constitution. This led to the revolt of Texas, which was full of settlers from the United States. Santa-Anna invaded Texas and gained some successes, but was surprised and taken prisoner at San Jacinto on the 21st of April 1836. The Texans had a good excuse for shooting him, as he conducted war in a ferocious way. They preferred to let him save his life by ordering his troops to evacuate the country. He was released in February 1837, and had for a time to "retire to his estates" in Vera Cruz. In 1838 the French government made an attack on the town, and Santa-Anna, by a display of his redeeming virtue of personal courage, lost a leg but regained his influence. He became military dictator in 1841, and governed by violence until he was driven into exile by mutiny in 1845. He fled to Cuba, but was recalled to command against the invading army from the United States in 1846. The Americans beat him, and once more (1848) he went into exile. In 1853 he was recalled and named president for life, with the title of Serene Highness. In less than two years he was again. overthrown and had to go abroad in August 1855. For the rest of his life Santa-Anna was hanging on the outskirts of Mexico, endeavoring to find an opening to renew his old adventures. He tried the emperor Maximilian, the French and the United States to see if they would serve his turn. But he bad outlived his time. The empty title of grand-marshal given by Maximilian was all he gained. When in 1867 he attempted to head a rising, he was captured, and condemned to death, but spared on the ground that he was in his dotage. At last, worn out by age, he accepted an amnesty and returned to the city of Mexico, where he died in obscurity on the 20th of June 1876.